- the air conditioning system will be turned on. - the recirculated air position will be selected. - the face mode will be selected. 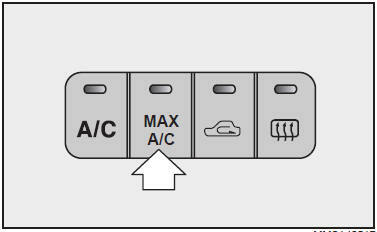 If you select the MAX A/C mode, you could not cancel the A/C system and the recirculated air position. Set the fan speed control knob to desired speed and rotate the temperature control knob to the extreme left position. To turn the MAX A/C mode off, press the MAX A/C mode button again or select the others except face mode.